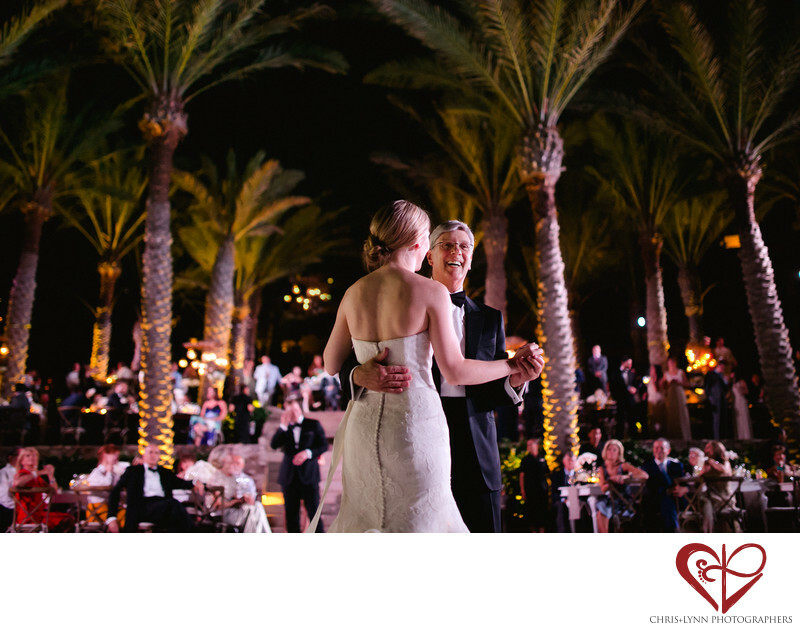 This black-tie formal reception at Esperanza Resort was incredibly romantic. The rows of tall, lush palm trees swaying above the candlelit tables; the sound of the ocean waves crashing in the distance, their white crests illuminated by the moon; the elegance of the of the guests in their sparkling gowns and tuxedos; and the giant dance floor created on top of the main infinity pool. The white dance floor also showcased the live band who flew in from Chicago for the event - they had everyone on shaking their booties with enthusiasm by the end of the night. Surprise fireworks added to the wow factor of this luxury Mexico destination wedding. We love photographing all the reception celebrations! The energy on the dance floor is always fun to capture, and the first dance and parent dances are always full of emotional. This image of the bride dancing with her father is one of my favorite dance photos. I love the way the background really reflects the ambiance of the reception and its warm lighting and decor. I love the father's smiling expression as he dances with his daughter. And the final touch is the groom wiping away happy tears as he watches them together from the terrace. 1/250; f/1.4; ISO 3200; 35.0 mm.